Back when the West was still wild and the rifle was the tool of choice for survival and frontier justice, the venerable .44-caliber put more meat on the table and outlaws in the ground than any other bullet. 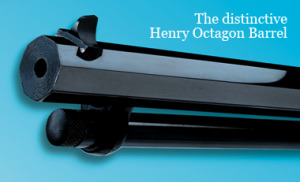 The West may have been tamed and fenced long ago, but its unbridled spirit lives on in this line of traditional big-bore Henry rifles. Choose from .44 Magnum, .45 Colt, and .357 Magnum. Both are SASS approved so Cowboy Action shooters who enjoy stepping back to that bygone era can use them in competition. Don’t let the retro look fool you, these rifles are much more than shooting’ irons for today’s new breed of cowboy. They’re also the unbeatable choice of big-game hunters who prefer the traditional look, feel, reliability and accuracy that comes from an authentic Henry rifle. Each Big Boy receiver comes drilled and tapped for easy scope mounting, and the barrels are fitted with fully adjustable sights The traditional 20" octagonal barrel is outfitted with a classic fully adjustable semi-buckhorn rear sight with a reversible white diamond insert and a brass beaded front sight. The tubular magazine tops off at 10 rounds. Both the straight-grip stock and forearm are crafted of select American walnut accented with a brass barrel band and Henry’s recognizable brass receiver. All have that crisp, smooth action that sets an authentic American-made Henry apart from other lever action rifles on the range and in the woods today. The .44 Magnum can also shoot .44 special rounds, and the .357 Magnum can also shoot .38 special rounds. Receiver Finish Polished Hardened Brass Length of Pull 14"